Let us pray for you! 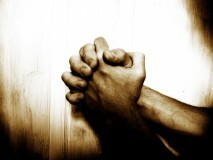 The Prayer Partners ministry of St. Thomas’ will offer your praise/prayer request in prayer for four weeks. To submit your confidential prayer request, complete the online form below. For more information about joining our prayer ministry, email the parish office or call (585) 442-3544. Or, contact our Watchcare ministry leaders directly by using our group finder. Use this form to submit your prayer requests to our Prayer Ministry team.